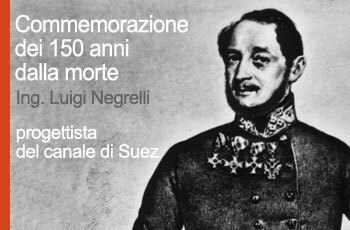 This year is the 150th anniversary of Engineer Luigi Negrelli’s death (Fiera di Primiero, Trento, 23 January 1799 – Wien, 1st October 1858). He was a pioneer designer of railways and also a prominent civil engineer of world renown and is known above all for his studies and designs of the Suez Canal project. Knighted by the Emperor of Austria Franz Joseph, he is known in the German-speaking countries under the name of Alois Negrelli, Knight of Mondelba. In view of all this, it seems quite proper for us to promote a series of public events that on the one hand do intend to celebrate the outstanding figure of Engineer Luigi Negrelli and on the other hand enable us to exploit, in a modern key, both the initiatives and the human resources, nowadays present in Trentino, with an aim to universality of knowledge, and to multidisciplinary lifelong learning.